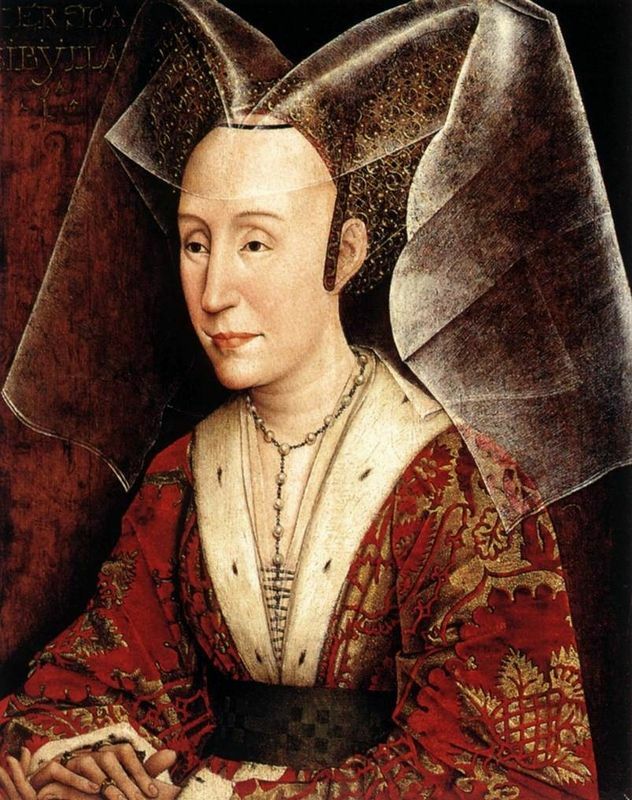 Lady Wearing a Gauze Headdress depicts a young woman probably from the Netherlandish middle-class. 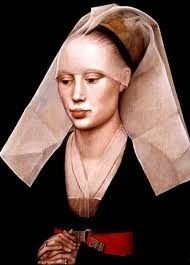 Her definite identity remains a mystery, though it has been suggested that van der Weyden perhaps used his wife, Elisabeth, as a model, maybe in an effort to practice his portraiture skills or to have a lovely image of his wife to display proudly in their home. 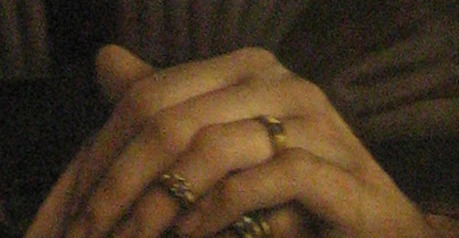 If this is, indeed, a portrait of the painter's wife, then one of his inspirations could have been his affection for her. But, other than mere speculation, scholars have very few clues. This charming and effortlessly executed portrait depicts a young woman, seated upright with her hands clasped self-consciously in front of her. The horizontal lines in the upper half of the image - caused primarily by the creases and folds in the woman's headdress - contrast well with the vertical lines of the lower half of the painting - caused by the folds and stitching of her dress. 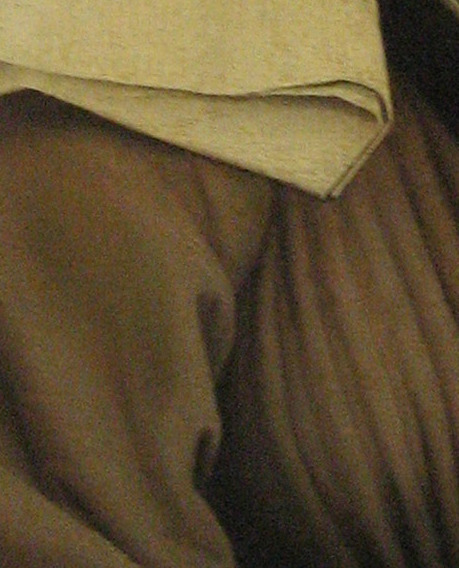 In order to balance and add further interest to this composition, the lowest portion of the painting brings back the horizontal lines we see in the top half through the woman's fingers and some of the folds in her sleeves, which help serve as a transition between the extreme vertical and extreme horizontal. The light source in this painting is unseen and originates somewhere above the subject and a little to the viewer's right. 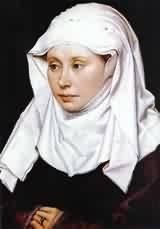 Van der Weyden used this light - which is soft and presumably indoors - to help him create the delicate shadows and folds of the lady's garments, like the accordion pleats across her breast, and the softer draping of her sleeves and headdress. 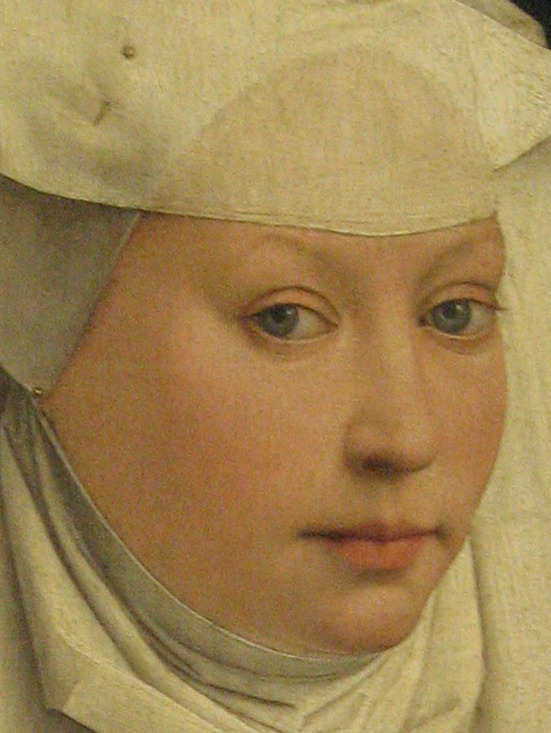 The overall feeling of this painting is one of great intimacy that is absent from nearly all of van der Weyden's other paintings. It is this intimacy - created primarily through the subject's direct gaze and the simple radiance of her face - that has led many to assume that the subject is the artist's wife, Elisabeth. 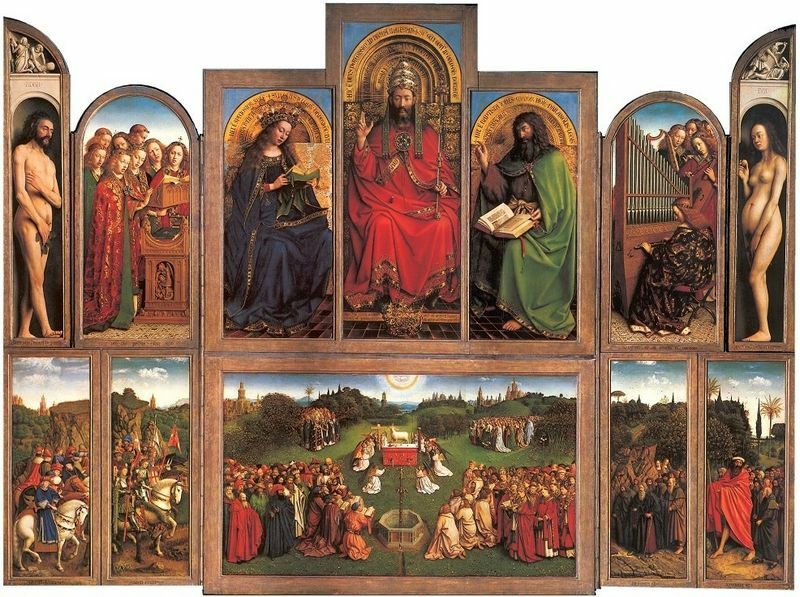 The concept of the sitter making direct eye contact with the artist/viewers was quite novel when this painting was executed, with Jan van Eyck being the first Netherlandish painter to incorporate this technique. Most portraits from this time period displayed the sitter's eyes as downcast or gazing into the distance beyond the viewer and painter. 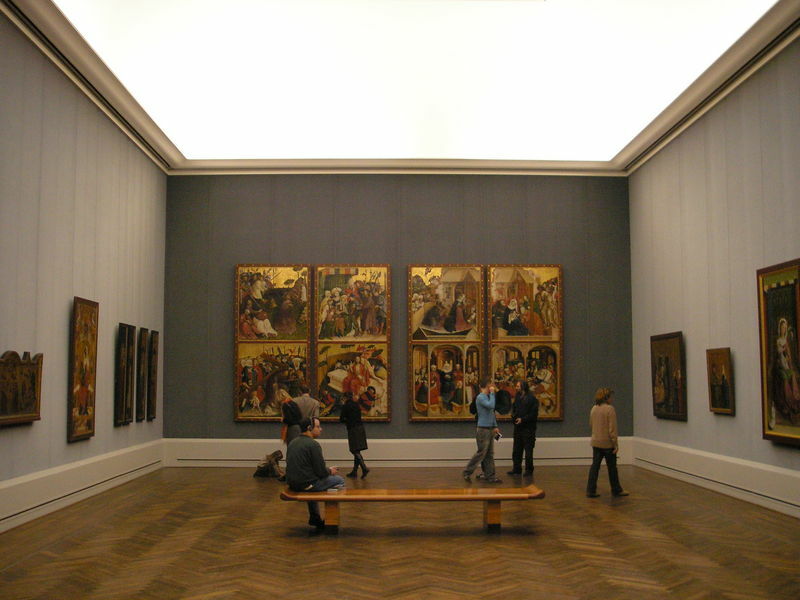 Today, this painting is housed in the Berlin State Museums' Gemäldegalerie where it has been since 1908. Prior to that, it supposedly belonged to the collection of a woman who went by the name of Princess Soltikoff, in either Paris or Saint Petersburg. 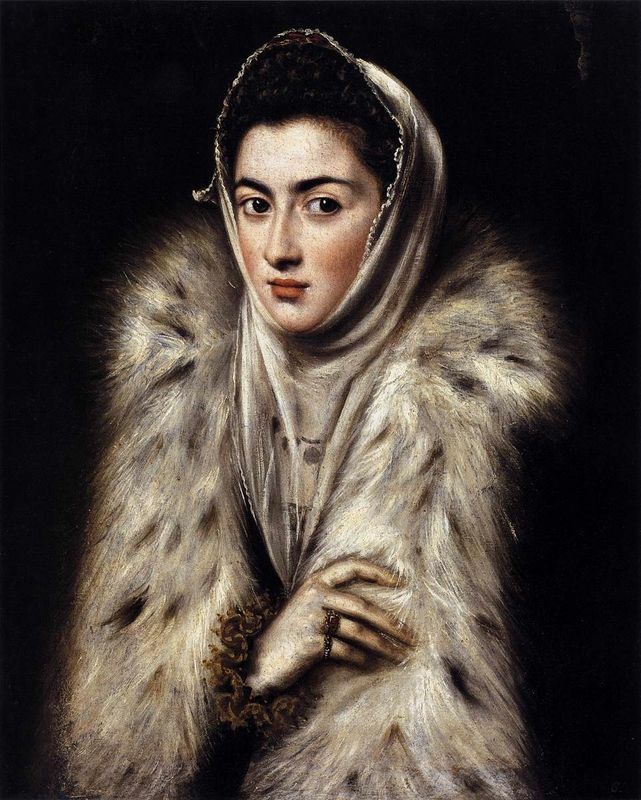 During the artist's life, Lady Wearing a Gauze Headdress would have been relatively unique due to the direct gaze of the sitter. Today, the work is appreciated for its simple and natural beauty and for the juxtaposition of the sitter's soft features with the crisply folded headdress. 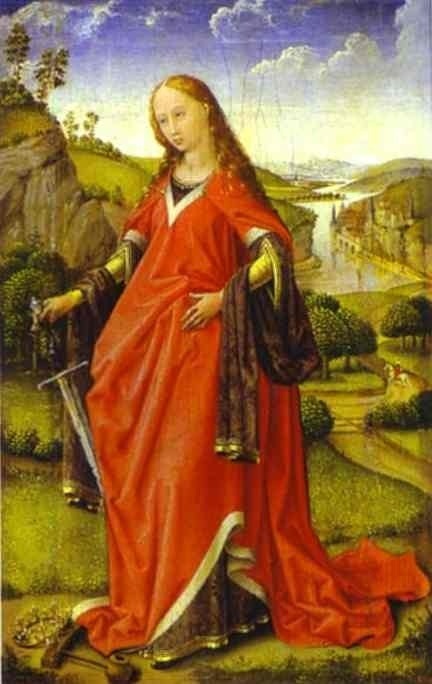 Rogier van der Weyden was seen as an innovative painter, with a fresh vision and acute sense of emotion - qualities often devoid in artists during a time when formulaic religious depictions were widespread.